Race into savings! We are now offering financing! From good credit to bad credit we can get the fence or deck of your dreams financed! We have non-credit based financing call for details! Please email us at info@topchoicefence.com or call 765-215-4198 for any questions. Top Choice Fence We are a high quality professional fence company serving residential, commercial, as well as government customers. We install all types of fencing, wood, chain link, aluminum, vinyl, and farm fencing. Most everything we build is built on site and you are able to see each step as we transform your property. We are also one of the few Indiana companies that have experience in installing the Simtek Simulated Rock Wall fencing. We install fencing for everyone. We have worked with many homeowners, business owners, farmers, and HOAs. We have installed fencing for the US Navy, the Indianapolis Colts, and many of your neighbors. We have the experience and expertise that you are looking for in your project. 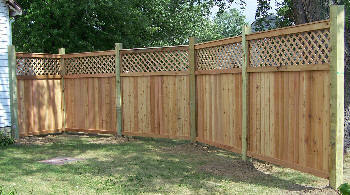 We offer new installations as well as repairs to existing fences. Being a family owned and operated business, we are able to beat most competitors prices. We will come to you and give our estimate free of charge and if another fence companies estimate is lower, WE WILL BEAT IT!